An exceptional summer house in a unique beachfront setting. Immersed in the vineyards that so characterise the Menfi area of Sicily, Casa Agave is one of those rare villas that could be said to have it all: stunning sea views, a gate leading onto the gorgeous sandy beach of the Belice Nature Reserve, a dreamy infinity pool and access on foot to one of the best trattorie in the area. Inside: accommodation at Casa Agave is organised over two floors. The main entrance takes one into the spacious open-plan, sea-view living and dining area, whose double height ceilings, double aspect glass sliding doors and clerestory windows make for an airy atmosphere. The sliding glass doors lead straight out onto the pool area on one side and the side terraces on the other. To one end of the living and dining area is the well-equipped kitchen with breakfast table, views out to sea and access via French windows to the shady al fresco dining area. Accommodation on the ground floor is completed by a double bedroom with en-suite shower room, a double-twin bedroom and a family shower room. Both bedrooms have direct access to the surrounding terraces. Stairs lead up to the first floor gallery overlooking the living and dining area below. From here one accesses the third bedroom, a double with en-suite shower room and a little roof terrace. Outside: the outdoor areas at Casa Agave provide space for relaxing, having fun and enjoying long convivial meals. Accessed directly from the kitchen is the shady al fresco dining area, which, like most of the outdoor areas looks out to sea. A few steps away from here, and seamlessly connected via large glass sliding doors to the indoor living room, is the dreamy pool area, whose infinity pool, complete with hydromassage corner, is flanked by terraces furnished with sunloungers and a large romantic daybed. Steps lead down from here to the garden, which is planted with palm trees, agave and other Mediterranean flora, and furnished with a lovely decked area overlooking the beach and the sea, the perfect spot for an aperitif as the sun goes down. This area is also where you will find the magical sea gate, which opens directly onto the dunes of the Belice Nature Reserve and, just 130m away, the long sandy beach and transparent waters of the Mediterranean Sea. The long (over 3km) sandy beach in front of Casa Agave rarely gets very busy, even in August. Guests staying at Casa Agave also have privileged access to Planeta's exclusive Beach Club at nearby Lido Fiori in Menfi (entrance fees apply). Cycling in the Menfi area is a very pleasurable pastime, thanks to both the quiet back roads and the purpose-built cycle track along and around the old railway line between Menfi, Porto Palo and Sciacca (running very close to Casa Agave). We’d be delighted to have bikes delivered to your villa and, if anyone in your group is an inveterate pedaller, arrange for a local guide to show them the best routes. Casa Agave features an infinity pool, offering swimmers stunning views while in the pool. There is a drop from the infinity edge, so we recommend children are supervised at all times. Please refer to our general safety page if you would like more information about infinity pools. With one of Sicily's loveliest stretches of sandy beach on your doorstep (not to mention the seafood restaurant of La Pineta - about 2km along the beach of the Belice Nature Reserve), you may never feel the need to explore to the other lovely beaches in the area, such as the one at Porto Palo, which has received 20 consecutive "Blue Flags", attesting to the cleanliness of the water and their general ecological excellence. 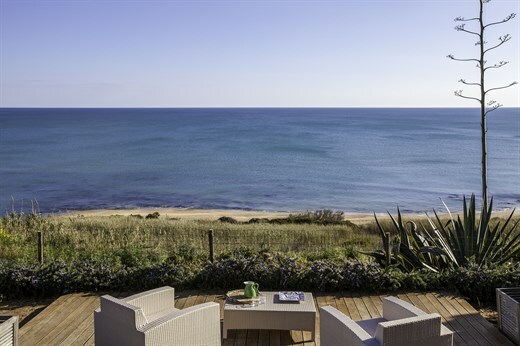 For a day on the beach with facilities, guests staying at Casa Agave may choose to take advantage of their privileged access to Planeta's exclusive Beach Club at nearby Lido Fiori in Menfi (entrance fees apply). Casa Agave is ideally placed for visiting the stunning archaeological site of Selinunte and the Cave di Cusa, while there are several interesting historic towns within easy driving distance, including Sciacca and Mazara del Vallo, both of which have charming old centres, some great restaurants and working ports with a large fishing fleets that work the Mediterranean daily. A little further afield but still in easy day-trip distance are Marsala, Trapani and Erice. Caltabellotta is spectacularly situated in the craggy hills overlooking both coast and interior, while Menfi itself is an up-and-coming centre of excellence for the wine trade. Sandy beach: you're right on it! "Casa Agave is a very beautiful location beautifully maintained inside and out. It really had everything one could want." Casa Agave was breathtaking and exactly what we needed as a family with teenagers. It could not have been better. It was exceeding our already high expectations. Watching the sunset from the little swing at the end of the garden was our everyday highlight in a highlight-filled week. We had an amazing time. Everything was faultless in Casa Agave. It felt like home the moment we arrived. We really enjoyed the countryside surrounding the villa and its peaceful setting in Sicily was a highlight. Casa Agave is absolutely beautiful, inside and out. The villa is light-filled, serene, and comfortably furnished, and the kitchen has everything one could possibly want. The location is perfect: we walked on the beach every day, swam in the pool, and explored the nearby cities (and as far afield as Agrigento). The owner was gracious and warm and took care of everything with perfect dedication. We're already thinking about when we could come back. Our holiday was amazing, the best any of us of ever had - absolutely nothing we didn't enjoy. Casa Agave was FANTASTIC. It was serene and beautiful and fully equipped. BRILLANT BRILLIANT BRILLIANT! I confess we really didn't leave the villa. We did walk along the beach but all four of us needed some down time and we couldn't have picked a better location or villa or company to book with. You literally took all the stress out of the holiday. Casa Agave is a very beautiful location beautifully maintained inside and out. It really had everything one could want. Having an owner who prides himself on cleanliness inside and out makes a big difference. Casa Agave itself and its gorgeous views were unforgettable. Overall it is a very beautiful and relaxing place to be and we had a wonderful time. Casa Agave was just brilliant! Our holiday at Casa Agave was pretty much perfect, thank you! The view really was breathtaking and the owner was excellent. It is rare that my expectations are exceeded but in this case I can state that they were significantly exceeded! Everything about Casa Agave was outstanding - the size, quality, location, view, amenities. It is also rare to find that everything we needed was there. The owner was also fantastic. We called the beach at the bottom of the villa garden our beach because there was so rarely anyone else on it. We had an absolutely fabulous time and really could not fault the villa, location, the owner or the Thinking Traveller staff. Casa Agave is in the most fabulous location - that is it's main selling point, clearly. Its views and proximity to such a quiet, unspoilt beach with clear, clean sea in a Nature Reserve is extraordinary and we loved that. Incredible in July to be that empty and quiet. The infinity pool is perfect - great size, great temperature and aesthetically beautiful. The house is so spacious and the sitting room fabulous. The bedrooms are all great, and the downstairs bathrooms are wonderful. The owner is a gem! The cleaners are so thorough - very impressive! kitchen is an amazing size. Particularly enjoyed hanging out at the villa, in the pool and on 'our' beach. Also enjoyed cook's dinner. All in all, a fabulous villa! Our stay at Casa Agave was the perfect combination of relaxing beach holiday and adventure. We want to go back! Casa Agave is in a lovely setting with remarkable scenery. The local manager was lovely and very helpful throughout. Our cook was a true gourmet chef and Western Sicily wizard. Our holiday was amazing. The host at Casa Agave was very helpful and so congenial. We all love the area. The villa was perfect for 4. We wanted a quiet holiday to relax by the sea and a pool - this villa achieved this. In-villa cook was excellent. The setting of the villa and the fact that it also has a pool makes it genuinely spectacular. The biggest surprise was just how wonderful our position was and how empty the beach was at this time of year. All good. The in-villa cook was very good. We didn't do much - too busy enjoying the villa, pool and beach! The ambience of the island, particularly the area we were staying in, was great - very relaxing and enjoyable... The villa was expensive but you definitely get what you pay for! The in-house cook was great and I thought good value for money. Haus an toller Lage und hervorragend für Familie.